A slideshow and some bullet points from the August meeting of the Top-Bar Beekeepers at DeLaney Farm. Leave a comment w/any questions. * Update on the hive that was combined last month. * "Best" style of top bars to use. * What is the best kind of bee brush to use? * Using a pollen trap. * How to crush and strain honey. * July and August were record-breaking dry and hot, so not much honey was made this Summer. * The only significant plants yet to bloom are rabbitbrush and goldenrod, not ideal for another harvest; today's harvest will be the last of the year. * Any comb that is at least 50% capped is harvestable since it's so dry in CO.
* The minimum number of combs needed for overwintering is 15. * In the past Marty has said 12, but conditions have changed and 15 is a better bet. The past decade has seen weather records broken routinely: most number of days in the 90s, coldest Winter ever, driest Summer ever, etc. 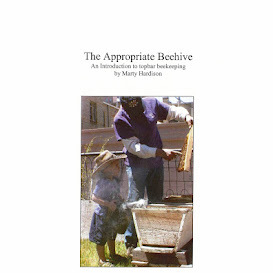 * the falseback is normally put in the hive in October, but we may do it early at next month's meeting. The September Top-Bar Beekeepers meeting at the farm, the last one of the year, is on the 10th at 9AM. According to Marty, using a smoker is "____________________________." Fill in the blank. Hmm. Can't see any slideshow link, either in Firefox or Explorer. I'd like to see your pics! Also, what was the consensus on bee brushes and top bars? Oh! I can see the pictures now. I wonder what changed. Thanks for checking back @Kitt I redid the html on a bunch of posts so slideshows are showing, at least in full browsers. They still don't show in mobile view, but Blogger's constantly "improving" so maybe they'll magically appear soon. @Kitt Your fill-in-the-blank answer is a good one but not the one I'm looking for. Still interested in the prize? HINT: the "correct" answer is in the slideshow.